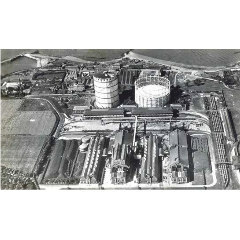 In the 1890s, gas was being produced in Edinburgh, Leith, and Portobello and the sites were operating at full capacity. 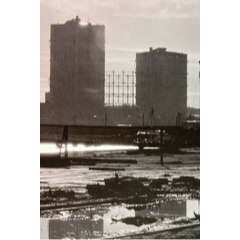 It was decided to build a substantial new single-site gasworks capable of future expansion. 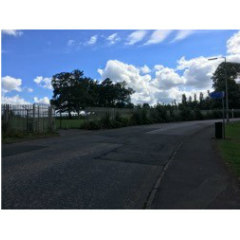 Following negotiation with the 6th Duke of Buccleuch, a 106¼ acre site at Granton was purchased for £124,000. An impressive structure, the most elegant gas holder in Scotland in terms of its external framing was erected as part of a £450,000 state-of-the-art coal gasworks between 1898 and 1903 under the direction of Dutch engineer W. R. Herring. Gas Holder Number 1, still standing today, had a maximum capacity of 7,000,000 cubic feet. Gas manufacturing stopped in 1987 and the building is now listed. The possibility of retaining this Gas Holder as an outstanding example of Scotland’s industrial heritage is under consideration. The 3 separate gas holders at Granton Gasworks. Photo from the John Dickson collection.